When I was at E for All on Oct. 3-5, I encountered a game that they had on display. I've honestly never heard of it, but it's a fairly new game, around 3 months old, launched on July 11, 2008. 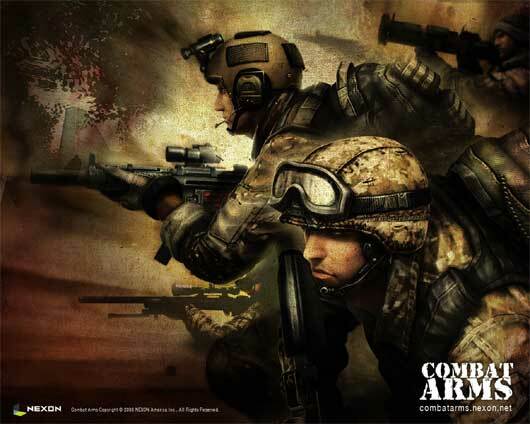 Combat Arms is a "free" online war-inspired first-person shooter developed by Doobic Studios and published by Nexon. The game is pretty damn intense and completely free. There are aspects of the game that you must pay for however, with NX cash, such as character models, certain weapons, name changes, etc in what is called the "Black Market". Also, after each match, you earn GP(in-game currency) which can be used to purchase character/weapon customization and so on. The gameplay is fast and a lot of fun. The graphics, because the game is free, aren't equal to Call of Duty 4 or Gears of War, but that shouldn't matter anyways. This is a great "pick up and play" type of game. Lots of great weapons and fast-paced action. I highly recommend Combat Arms to anyone who is a FPS fan. Get downloading now and see ya on the battlefield!